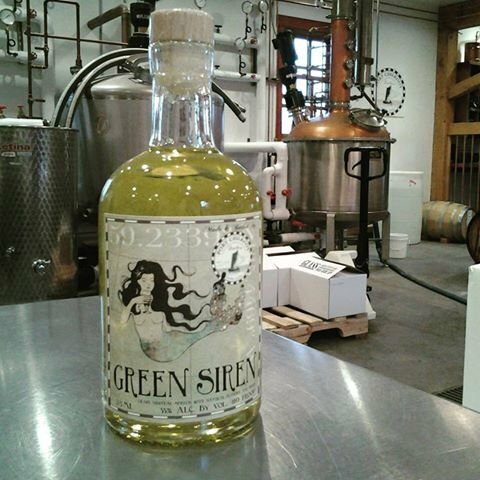 The first absinthe made and bottled in Alaska. Appearance: Pale straw with hints of green. Louche: Very little louche to speak of, unfortunately. It's not hazy, per se. A bit thicker than that. But it's not as thick as a traditional absinthe really should be. I think this might be due more to its relative 'newness' more than anything else, as I've seen this with many brands as they first are released. If they recycle some more tails and work on ratios, I'm sure they can thicken it up nicely. Aroma: unlouched, you get lots of nice anise with an underlying alcohol punch. Louche, it is quite light, delicate and restrained. Again, not atypical of a brand that's just been released for the first time. Many distillers practice some level of restraint at first with their absinthes in fear of overdoing it. I think there's evidence of that here. Flavor: Too light, but what there is there to taste, it's delicious. A very nice blend of the holy trinity is apparent, but again, it just seems restrained. But all the right flavors are there. It just needs a bit of 'oomph'. Finish: As with everything else mentioned above, the finish is light and delicate. But it's still quite enjoyable. There's nothing 'off' about any of the flavors or aromas, so it's very easy to drink. The finish sticks with you for a bit, but not as long as I'd like. Overall: This is a solid first step. A nice offering. The recipe seems to be coming at it from all the right angles (although it's doubtful that it came from the 1700's as claimed). It just needs a bit more of everything to give it some more character. If this is the first step, I'm excited to see how this brand develops over the next few batches. If they play their cards right, they could have a VERY nice absinthe here. Great start!